Red Mountain is an AVA (American Viticulture Area) which for the longest time was the smallest in the State of Washington. While the area has grown some in past years, smaller such areas have been designated recently moving it up the list. Still it is estimated that only about 700 acres are planted on Red Mountain. It is not the size of the area that makes Red Mountain unique, rather its dramatic diurnal temperature swings (temperatures exceed 100° F in the ripening phase of fruit development in August and September, with overnight lows dipping well into the 60° F range) of nearly 40° F. Intense heat in combination with sand and eroded soils, work to limit vine vigor forcing the vines on Red Mountain to focus energy towards fruit development. Wine grapes become super intensified on Red Mountain. The cool nights help to slow the overall ripening duration down which helps to develop flavor and the overall complexity of flavors in the fruit. Think braising as opposed to flat out broiling. However you care to consider it, Red Mountain is an area that is superb for the development of big flavor in red grape varieties, especially Cabernet Sauvignon. We have pulled Cabernet Sauvignon from two sites on Red Mountain, but presently are working exclusively within the 'Heart of the Hill' vineyard in partnership with Kiona Winery. Scott Williams along with his brother are second generation pioneers on Red Mountain. Their father initially purchased a substantial portion of the ground decades ago, and was the first to put grapes in the ground in the area. Today they remain one of the largest landowners on Red Mountain and over the past seven years have developed 25 new acres of grapes per year. We have always loved the quality of Clone 8 Cabernet (known also as the Washington Clone and the most widely used in the state) but recently began harvest Clone 2 Cabernet Sauvignon as well. We are really excited about this. It is a clone few have experience with and seems to offer an incredible full and savory mid palate quality. Red Mountain was the first source to warrant AERIALS status, and will remain a cornerstone for our wine program indefinitely. Located to the North of Pasco Washington as the Columbia River flows North to South, Sagemoor is among the older planting in the sate with very mature vines that produce fruit of tremendous flavor and dimension. Originally planted for larger scale machine harvesting production, Sagemoor underwent a critical shift in the 90's whereby farming practices were altered to cater to the creation of premium and ultra-premium wines. Now it is simply one of the finest sources for mature fruit in the state. Planted in 1988 Dionysus Block 11 Cabernet Sauvignon is really as good as it gets for old vine Cabernet Sauvignon in Washington State. We worked with this fruit for three years before releasing it as a standalone wine as part of the AERIALS Series, dialing in our approach. All along the fruit was top-notch. Each vineyard and each block - even different sites of the same clone - are wildly unique. This is Terroir. This being the case it takes a lot of time and many trials and iterations to make the best wine possible from each individual site. Weinbau Vineyard is the sister-site to Sagemoor, owned and managed by Sagemoor Farms, located approximately 60 miles to Northwest within the increasingly famous Wahluke Slope AVA. The attention to detail here is tremendous all thanks to Vineyard Manager Miguel Rodriguez and his wife. Together the pair and their team know every plant in every row of the vineyard. 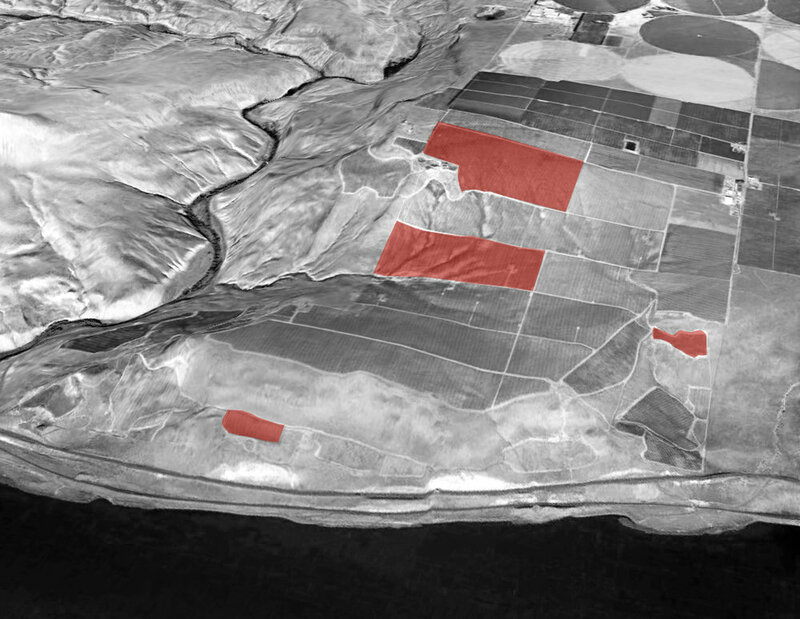 While most of the vineyard was planted in the '90s, though some blocks are much younger. Two of the most fascinating wines we produce at Revelry are grown in Syrah Blocks 18 & 19, fifteen feet from one another, in the same conditions, under the same care, yet they are completely different due to clonal selection. Working amongst these different sites taught us the importance of Terroir. Developing these two Syrahs taught us the significance of clonal selection. Much of Weinbau is part of a contiguous section divided into quadrants, with yet other outlying blocks interspersed amongst the surrounding orchards of neighboring farms. 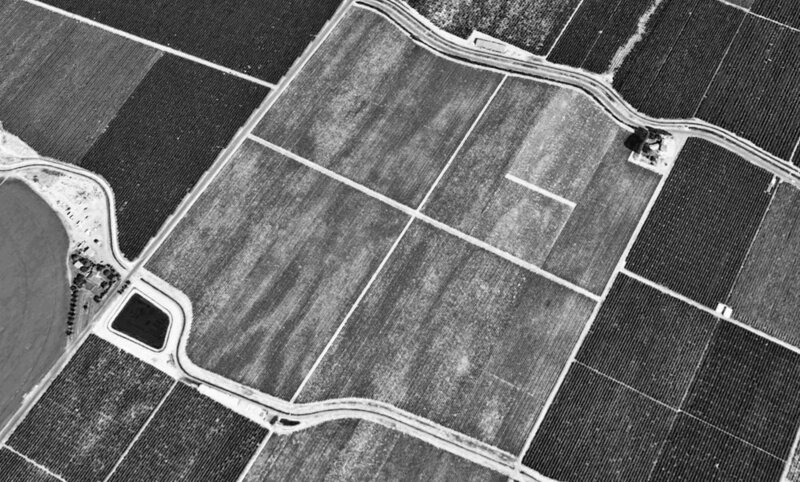 In the upper right quadrant of the aerial shot above two blocks are then divided by a short median. These are Block 18 and Block 19, both Syrah.